This SABRE Red 3-In-1 Pepper Spray with optionally available water-based Process Cylinder assists you get familiarized with pepper spray. 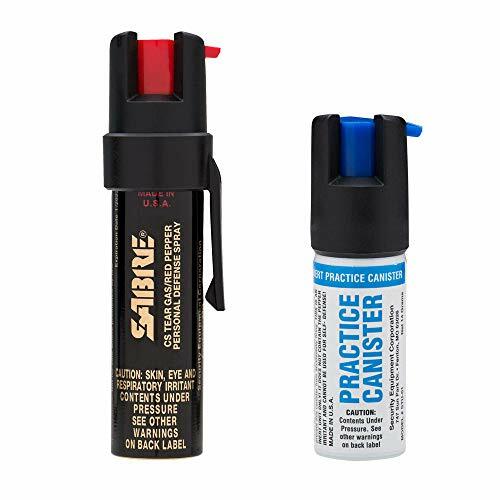 The SABRE 3-IN-1 Pepper Spray with Clip provides effective protection in a little, easy to access bundle. This system consists of a tough clip, for those who do certainly not like or utilize keychains. It simply clips in to a wallet, purse or backpack & gives quick, easy access. Registering at 0.75 ounces & consisting of approx. 35 ruptureds, this system possesses a highly effective flow spray design & sprays around 10' (3m) with the eyes as the spot of intention. The spray trend's benefit is actually that it decreases wind blow-back. It has a strengthened twist best protection to avoid unexpected discharge & is ready to go when you need it very most. To enhance acquaintance, improvement assurance, and also strengthen accuracy, the optionally available set (sold separately) additionally consists of a water-based practice container so you'll be actually prepped to utilize your SABRE pepper spray confidently in an emergency situation. It possesses a spray trend benefit that decreases wind blow-back & additionally has strengthened protection that protects against unexpected discharge. It considers 0.54 ounces with approx. 25 ruptureds at 10' (3m) with a highly effective flow spray design with a point of intention to the eyes. Supplying the world's very most reliable protection, SABRE's the greatest toughness pepper spray is actually supported through our unique internal jazzed-up fluid chromatography (HPLC) laboratory, which gets rid of the 30% warmth failure rate experienced with various other pepper spray companies (Source: Univ of Utah). This innovation is actually the only way to make sure there are no pepper spray failings on the basis of warmth inconsistency. Our HPLC innovation is actually the sector's # 1 benefit - and also it is actually unique to SABRE. Your pepper spray will contain the greatest quiting power when you need it very most. The Expiration Time of 4 years coming from time of manufacture is actually dual the sector ordinary & is actually a wonderful market value-- ensuring you have confidence for a long times to come. Loved ones had & operated for more than 4 decades, SABRE is actually the # 1 pepper spray company relied on through cops & consumers worldwide. ISO 9001:2008 certified, our pepper spray is actually happily created in the UNITED STATES. Shield your own self today!